You may have heard of the use of the abacus or soroban in some countries, and the impressive feats of arithmetic that proficiency in it allows. This app offers those who would like to develop these skills themselves the chance to do so. Not seen much in UK schools, but underpinning a quite phenomenal display of arithmetical skill in other parts of the world, the abacus might be something you want to introduce to your school or child. The layout of this abacus follows an easy to understand format and, with practice, can be used to carry out arithmetic and support the visualisation of arithmetic processes. What is amazing is that with more practice the actual physical device can be dispensed with and proficient users have a mental abacus with which they can perform maths faster than a calculator, with just some twitches of their fingers showing that they are still using the abacus in their head. In countries that truly appreciate this device, the use of them is built into the curriculum, but how do the rest of us develop familiarity with this tool and introduce our students and children to them? Ironically, for this efficient but decidedly low-tech device, a solution lies in the high tech world of apps with the Mental Abacus Expert app. 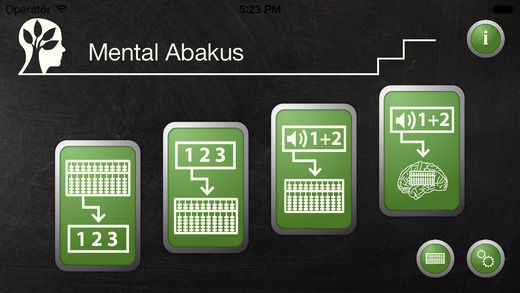 This app steps in as teacher to allow anybody to begin to learn, and eventually master, the mental abacus. This app provides everything you need to learn. With four broad exercises, fully supported with tuition, users of this app are led through perceiving and interpreting numbers on the abacus before going on to counting and doing arithmetic using it. The exercises involve both manipulating the abacus to reach an answer and using your own mental abacus to do so. In fact, exercise four creates a similar experience to the arithmetic competitions held for students capable of feats of arithmetic, including spoken instructions. Usefully, a stand-alone version of the abacus is also available within the app for teacher or parent created exercises, as well as for children to try to use the abacus in their other maths work. Tuition is provided with built in text instructions that are clearly written, albeit with a few grammatical errors. Supporting this is a selection of well-made videos that use the app to provide an explanation. These open outside the app, in YouTube, which is usable but not as ideal as having them open within the app. This feature does require that you have internet access, although the rest of the app can operate perfectly well without it. One of two types of abaci can be used in the app. A more modern one with a single bead above the horizontal bar and four below or the older version with two above it and five below. Each of the exercises can be tailored to the user’s ability with ranges of numbers and time delays for questions allowing for a gradual increase in challenge. 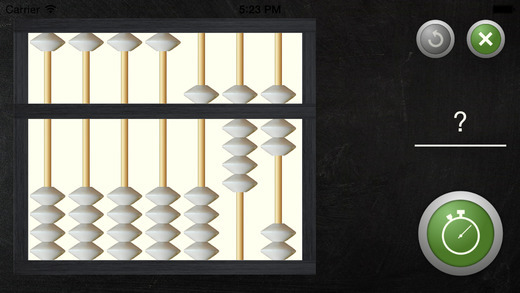 The app displays the abacus and questions clearly, and the methods of interaction are easy and natural. 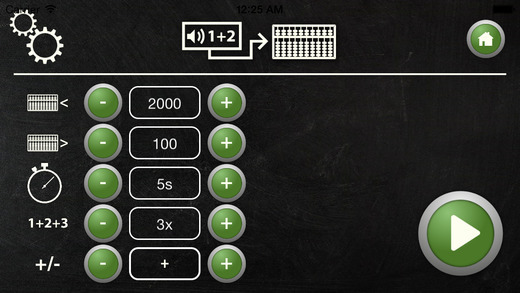 Tap the beads to move them on questions involving an abacus or enter a number using the inbuilt numeric pad. It is very straightforward to work with. These features ensure that the app is effective in its aims and is pleasant to use. It supports learners of the abacus in developing their skills gradually. Like any skill it isn’t one that can be gained immediately but with regular practice, and guided by this app, mastery can be obtained. Parents who would like to work on a fun and useful maths project with their children, teachers who would like to offer an extra-curricular activity, or mathematically interested children who would like to learn an impressive skill, could all make use of this app. 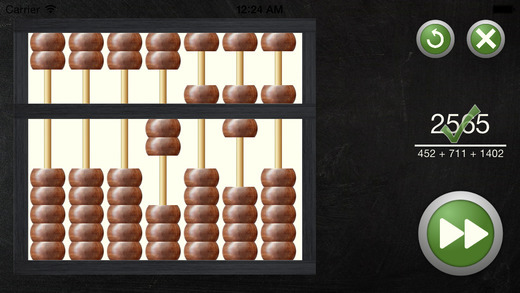 Working with the Mental abacus app will help you develop your mental arithmetic skills using the abacus. The four different types of exercises also trains your concentration and working memory. Exercise 1 - Quick interpretation of abacus figures. This exercise will practice your ability to imagine and keep the images clear in your mind. It is a skill that is essential if you want to develop mental arithmetic with the so-called mental abacus technique. Exercise 2 - Quick perception of numbers. The aim of this exercise is to develop your ability to quickly percept numbers in numerical form, remember the numbers, and then transfer them to abacus form. Exercise 3 - View / listen to numbers and count on an Abacus. In this exercise, you practice addition, subtraction or mixed arithmetic. This activity provides opportunities for you to develop mental abacus technique- that is the ability to order your mind’s eye to imagine an abacus, and then make the calculations on this inner, virtual abacus. Exercise 4 - Listen and/or view numbers and count on a Mental Abacus. This exercise practice your ability to imagine an abacus and make calculations on it. By practicing all four steps of the Mental Abacus app at each training session, you will notice that it gets easier and easier to mentally retain and imagine the beads movements for your inner eye. It is possible to train a fast and accurate mental arithmetic skill this way. - Four exercises that practice your arithmetic skills and develops mental abacus technique. - Choose between modern (4+1) or classic (5+2) abacus type. - Text- and video instructions. - The app has built in speech engine.